Welcome to Kaaredyret.dk - a privately-run and privately-funded freeware website. A section with links for templates & tutorials and help for OpenOffice.org, information about the ongoing development and links to official download pages. Please observe that LibreOffice and OpenOffice are completely compatible products. All tips, templates and extensions on this site should work with either of them. Imagine replacing all your costly software with free alternatives. This is the free software I personally recommend. Through collaborative projects WSPA is Campaigning Against Cruelty by exposing animal abuse and enforcing stronger laws; WSPA's Animal Rescue teams are working to save abandoned or neglected animals or those stricken by disasters; and by Changing Hearts and Minds amongst people living and working with animals, WSPA is forging a safer future for all animals. 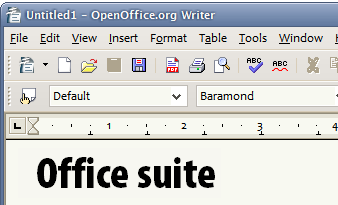 Version 3.3 of OpenOffice.org is finally here! Whats new? New narrow font family, 1 million rows in a spreadsheet, new common search toolbar, new print interface, increased document protection in Writer and Calc and more! Download now. » What is "in the box" - teach me about OpenOffice.org! » Quick install - download, expand, configure in minutes!